I like to make every holiday feel special, and that usually comes through on my table with food and flowers! I was in charge of planning Valentine’s Day this year and one of the things I wanted to do was make some homemade milk chocolate fondue. I went to Randall’s to shop for some fancy kebabs for the chocolate fondue and I think they turned out so cute. I LOVE fresh flowers too and sometimes I just have to treat myself to them when I’m at the grocery store. 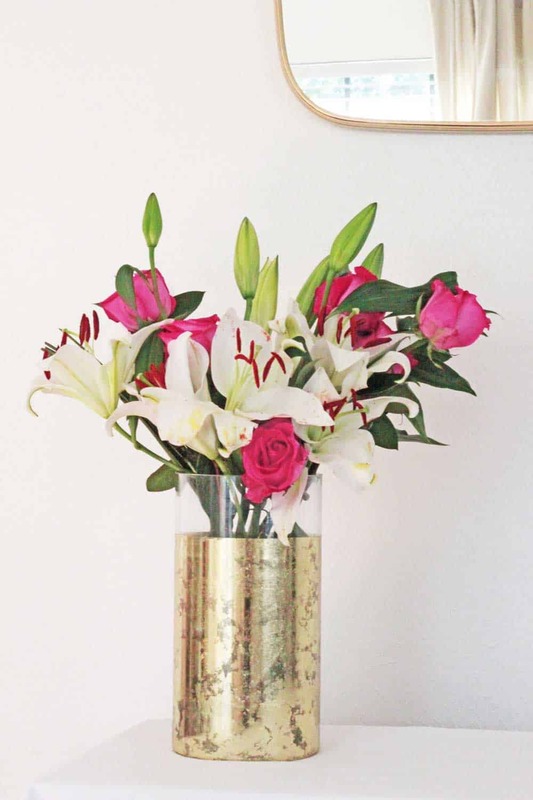 I love the debi lilly design™ arrangements that can be found at Randall’s or any Albertsons store. You know I love my gold! 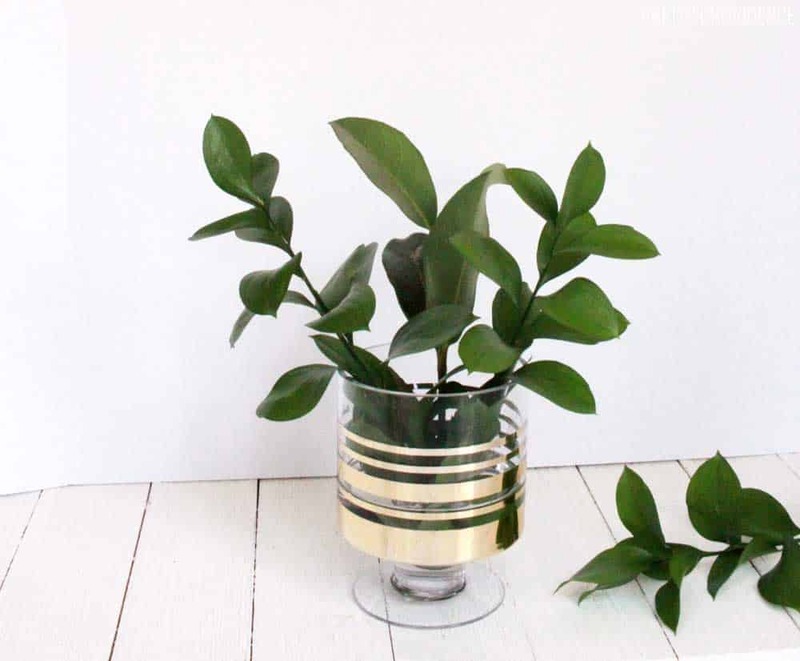 I got this big gold leaf vase for only $16.99. I could not believe the price of that! So good. Here is a photo of my ‘haul’ if you will! I could not resist all of the gold goodness! I wish you could smell the lilies through the screen. 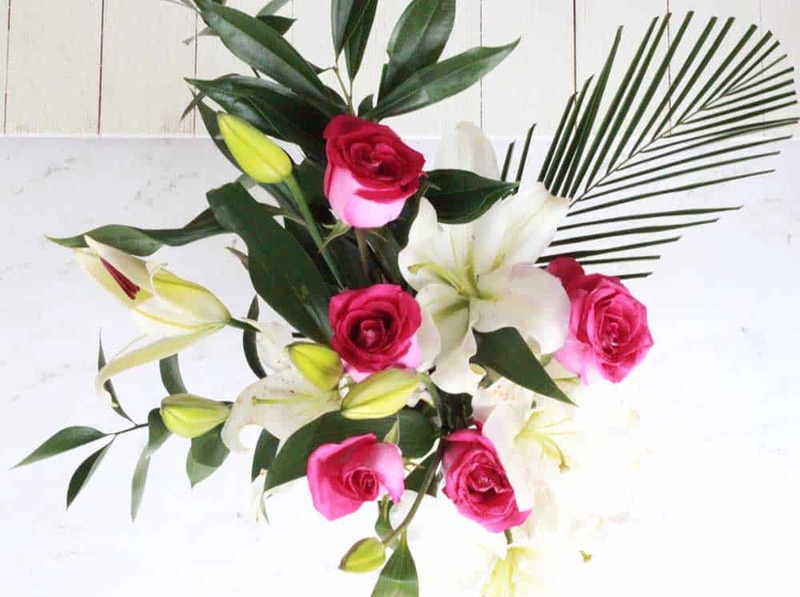 Isn’t this arrangement stunning? 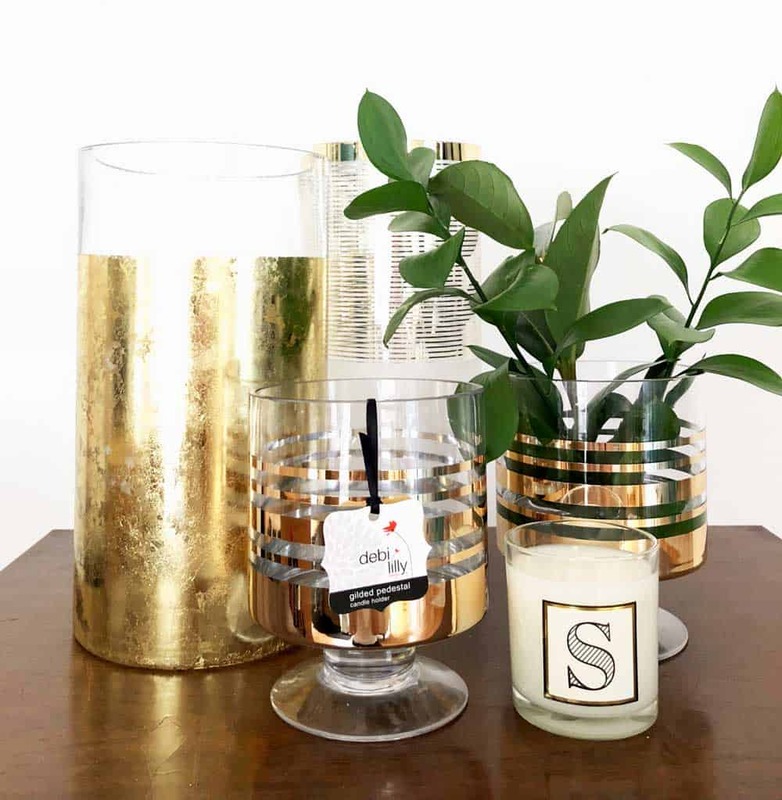 I got two of these debi lilly design candle holders with gold stripes on them – but I think this makes for a great vase too! I love gold and fresh greens together! For the fondue dippers I got jumbo marshmallows, brownie bites, strawberries and pound cake at Randall’s. I think pineapple or graham crackers would be amazing too. I cut the brownie bites into heart shapes (just with a regular knife) and the pound cake into little rectangles just because I think they look so cute like that! The skewers can be put together beforehand or you can just arrange the dippers all together on a tray. Do you have any special Valentine’s Day traditions? 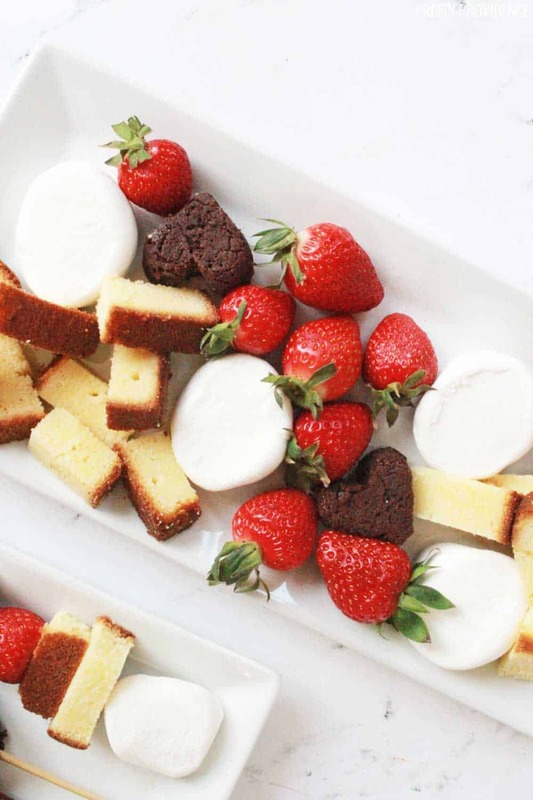 The best chocolate fondue recipe and ideas for what to dip in it! 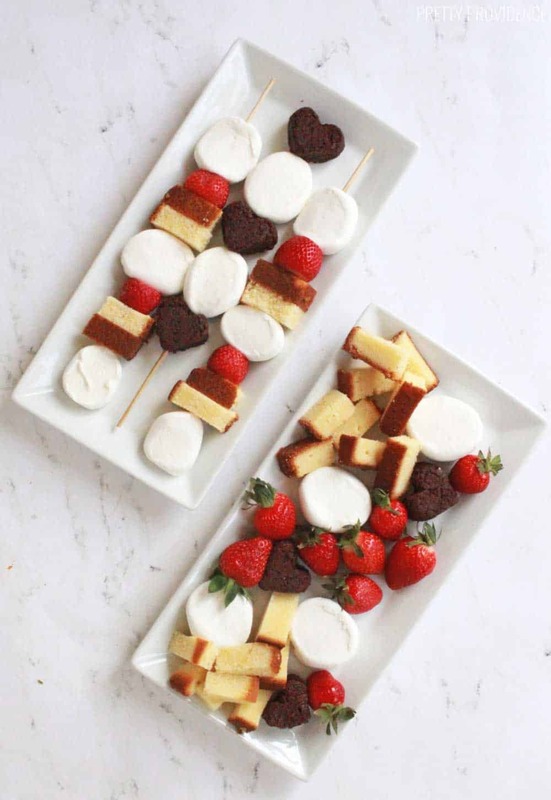 This dessert fondue is perfect for aValentine's Day at home or any other romantic date night in! Heat half-and-half and chocolate over low heat in a 2 quart heavy saucepan, stirring constantly, until chocolate is melted and mixture is smooth. Remove from heat. Pour into a fondue pot or shallow dish. 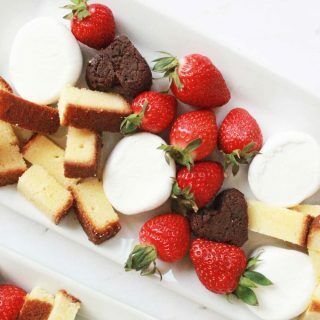 Cut mini brownies into heart shapes, and slice pound cake, strawberries, pineapple, and bananas up. Arrange on a plate and if you're feeling really fancy, make some of them into kebabs on skewers.